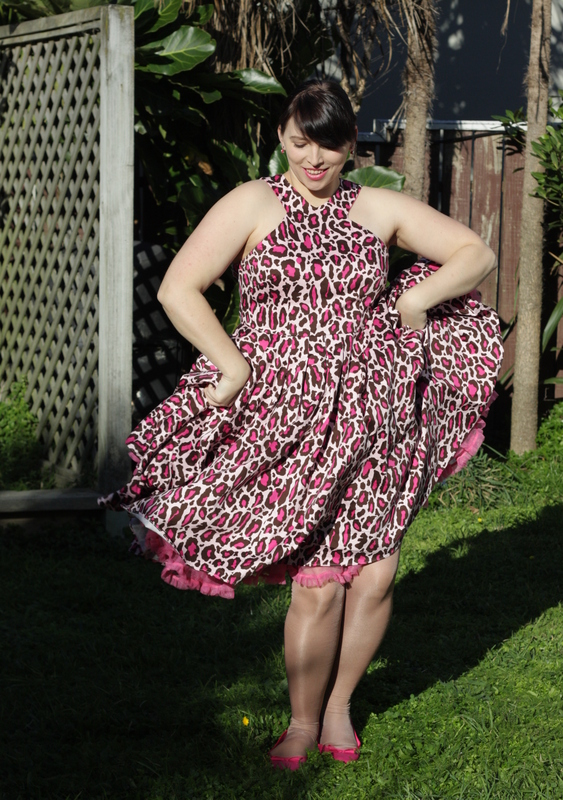 It’s been a long time coming, but I’m stoked to be able to share my pink leopard rock and roll dress with you! Like my skull and roses dress and flame dress before it, this was my annual make-the-most-crazy-dress-I-can for the Feet With Heat Dancer’s Ball (see here and here). I first found and fell in love with the fabric at Global Fabrics (now The Fabric Store) a few years ago, but managed not to buy any. Then the fabulous MrsC gave me a remnant for my birthday a few months later! Skip forward a couple of years and I’m planning my ball dress. I decided I want pink leopard and am hunting for a quilting cotton in the perfect shade of hot raspberry when I get a text from MrsC – “Global still has the pink leopard, and it’s HALF PRICE!! !” Although not the shade I had imagined, one does not look a pink leopard gift horse, err, leopard, in the mouth, so I strode in. As luck would have it, I ran straight into MrsC who was also succumbing to the sale (although, not on pink leopard) so she supervised as I took the bolt to the counter. “4m please” I said. That’s plenty for a rock and roll dress. “10m! Have you lost your mind!” I screeched. “Trust me. This is like a SIGNATURE print for you. I’ve never forgiven myself for not buying more of that rose printed silk-cotton that I made the dress out of that I wore until it disintegrated. You’ll use it. Or you could sell it if you change your mind later. And it’s such a good price. Trust me…” she wheedled. I have many mottos but one is never argue with your Wise Woman Advisor. I asked for 10 metres. The assistant unrolled the fabric. At 4 metres we discovered it was cut. MrsC gave me the gimlet eye so I ask to to take the 10 metres in two pieces. The assistant measured out the remaining piece and there was only 7 metres on the bolt. MrsC now turned her gimlet eye to the assistant and suggested they give me the entire 11 metres – but only charge me for 10, due to the cut. They obliged. And THAT is why you never argue with your Wise Woman Advisor. You want her on your side. The fabric is cotton spandex blend, but heavy, more of a twill weave than a sateen weave. 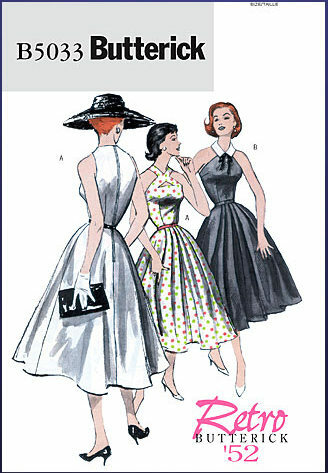 I settled on Butterick 5033. First up, the mock-up. I did my normal trick of finding the finished measurements (for Butterick, printed on the bustline and waistline on the tissue paper) and graded between the sizes that looked the best, completely disregarding the size chart. After a hilarious episode where I attempted to teach Mechanic Man to pin the centre back closed (honestly, the man can strip and rebuild an engine, but explain to him that the pointy bit goes in and comes out parallel to but 1.5 cm away from the edge and he’s completely lost), I got into the bodice. And WOE! Woe is me! The bottom wouldn’t even touch. 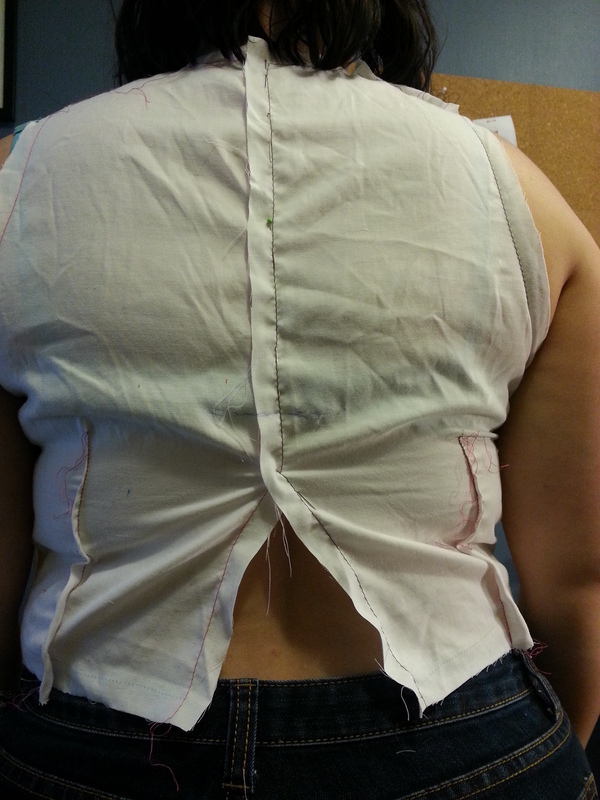 My first bodice toile. Oh no! I mournfully looked at the photo that Mechanic Man took for me and started mentally calculating the potential-faffing-about-factor, and resolved there was only one solution. One does not have a Wise Woman Advisor in the family just for fabric peer pressure. I took my bodice to MrsC. I’d already resolved the shoulder seams needed to be reduced to 1cm, and did this on arrival. Then I got pinned in (with much more efficiency) and waited for the diagnosis. MrsC, in the magical ways of Wise Woman Advisors throughout the ages, clicked her tongue, produced a ribbon, tied it around my natural waist, cut off the fabric under the ribbon, and pronounced it fixed. No, seriously. It was a perfect fit. Just Like That. (Wise Woman Advisors – you should get one). It was a piece of cake after that. I lined the bodice with some hot pink stretch cotton poplin I fortuitously bought at the same time I bought the black stretch cotton for the bodice of my flame dress with the startlingly acute realisation that pink would feature in my future (and likely will over and over again). I measured the seamline on my new bodice and the skirt and they were so close I decided not to adjust the skirt, but to make as per the pattern and take in the side seams if needed to meet the bodice. It’s not like the skirt of that volume would suffer. 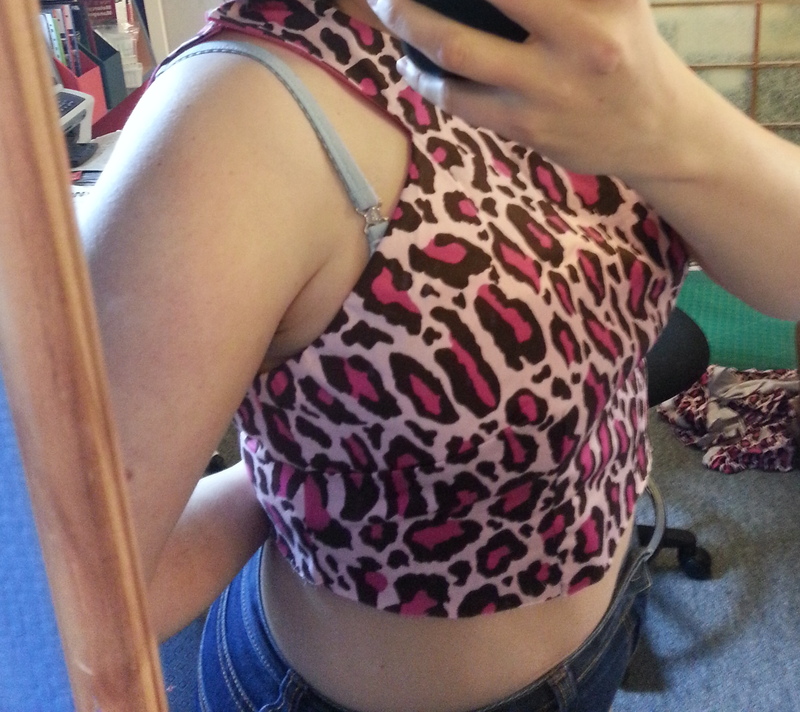 I did however discover the underarms sagged quite unattractively. So I used MrsC’s taping method and eased it on quite aggressively. Perhaps too aggressively, there are some little puckers when I’m not wearing it, but I’m totally pleased with the effectiveness of this technique. Armhole before taping, You can see that much of my bra because of the gaping. The skirt was a bit of a deliberately brave move for me. It has a centre front seam and three knife pleats either side. Did I really want pleats in the centre front or should I stick with a circle skirt? Did I need the extra bulk right of pleats and all that additional fabric right over my prominent tummy? That was the thought that did it for me. As a body positivity enthusiast, but not yet very experienced self-practitioner, I decided to give a silent SCREW YOU to whoever decided that women only look good with tiny waists and wear the skirt because I like it and that is the only opinion on the face of the planet that matters when it comes to what I wear. Plus, you know, I’d never made pleats before. 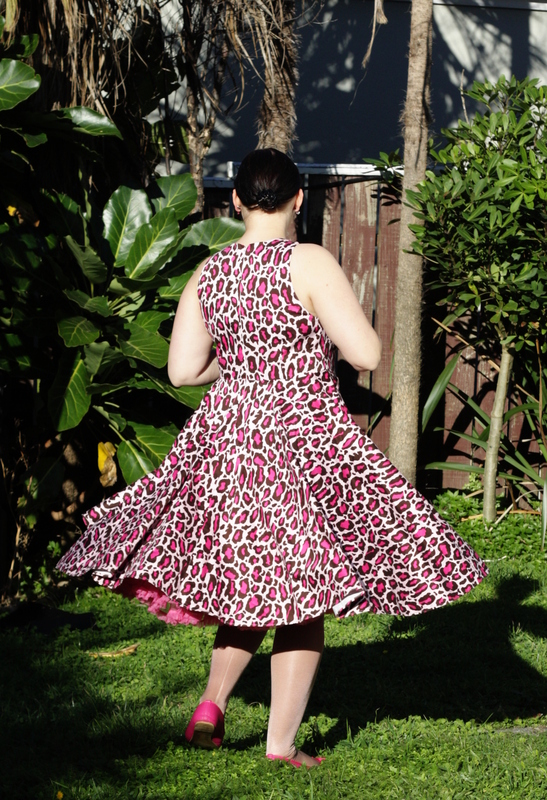 The pleats were easy, the skirt sewed up really straightforward (although I did get worried at one point as I attempted to maneouver the entire skirt across my sewing table that I was going to get trapped under it and weeks later they’d finally find me buried under 3 tonnes of leopard print) and the dress was done! I had originally decided to do the cutout, for a few reasons. First, it’s on the pattern. Second, I like cut-outs on principle. And third, I need lots and lots of ventilation in a dancing dress. 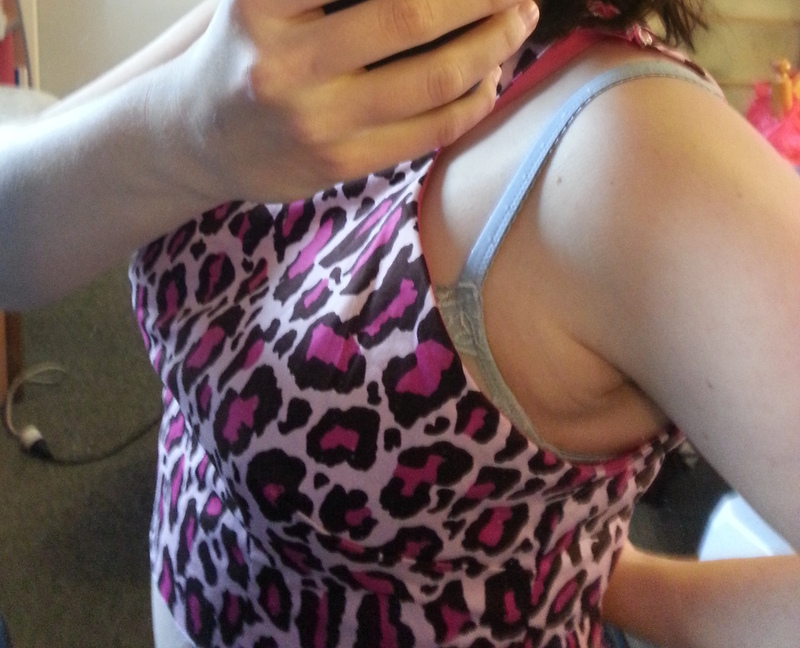 But after putting the bodice together, I was worried about attempting the cutout. What if I hated it? What if I cocked it up? I certainly couldn’t undo it! So I made a sample to test out the method and the look. I wasn’t convinced. The weekend of the ball I had my regular monthly craft day at my house, and my lovely friend Miss La Belle attended. 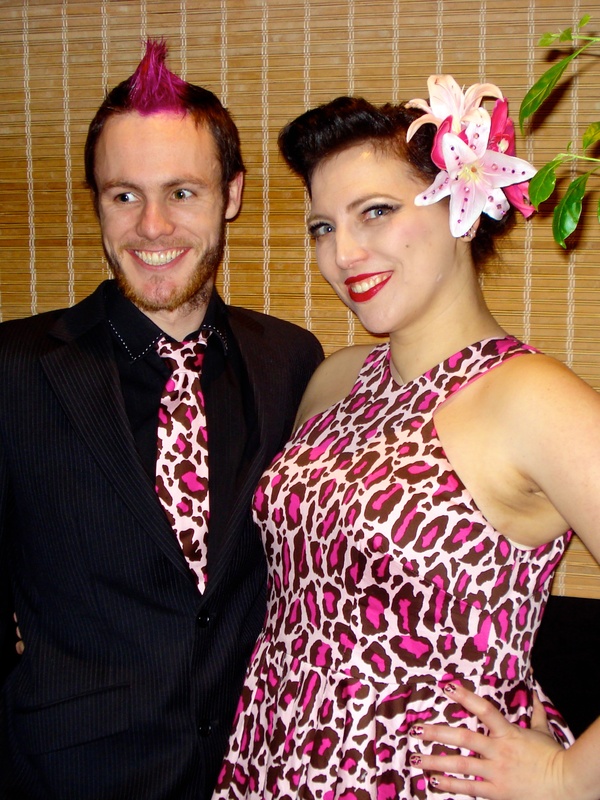 A couple of days before, at class, a fellow dance student asked if Punk Flatmate and I would be wearing matching outfits again, as they’d loved the matching flame outfits, and almost the same day Collette released their tutorial for a men’s necktie. Miss La Belle was looking for a project to do and volunteered to make the neck tie out of the scraps of my dress, and it came out AMAZING. But her awesomeness doesn’t stop there. Inspired by the pink and chocolate combination, she also made me two pairs of earrings and a necklace in that colour combo! I wore the studs on the night. The day of the ball rolled around, and as I normally do, I booked the skilled Claire of The Vanity Case to do my hair and makeup. Miss La Belle decided not to stop her awesomeness just with a necktie and jewellery and came over on the day to day Punk Flatmate’s hair pink to match and also painted my nails for me. IN PINK LEOPARD. Hell yeah! Oh yeah. 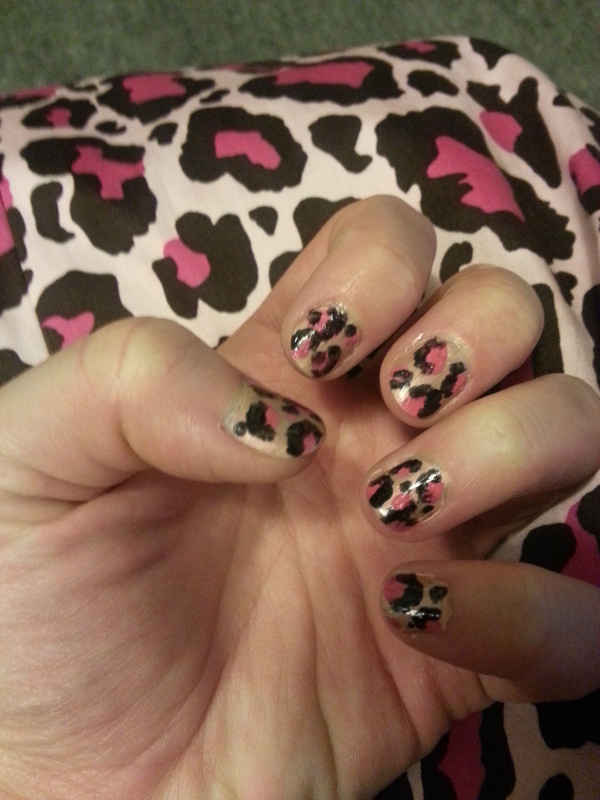 Pink leopard fingernails! I think it was one of the best hair and makeup jobs Claire has done yet, and I couldn’t believe it was really me in the mirror when she was done. Unfortunately, she’d had a really slim window to come over before I had to leave for the ball, so I skipped photos at home, thinking I’d use the event photographer to make up for it. She did take this snap on her phone though. Unfortunately, there was no event photographer! So Punk Flatmate and I asked some friends to take some snaps, but none of them really turned out spectacularly, but I’m still pretty sure you can get the idea that WE LOOKED FREAKING AMAZING HELL YEAH WE DID. We’re looking at two different cameras, whoops! But check out that awesome tie and matching mohawk! Isn’t he gorgeous! Photo courtesy Julian. Or Chris. 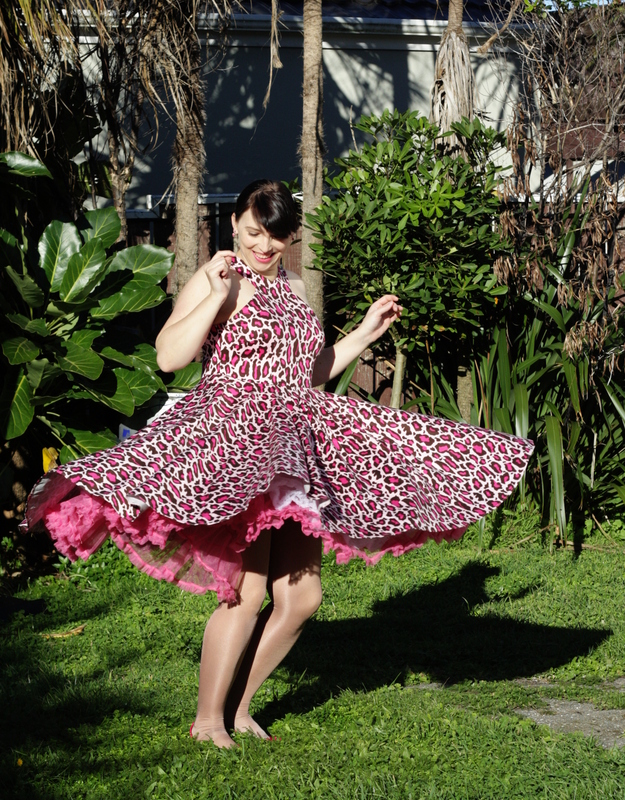 But the lack of event photos means no action shots of my skirt and petticoats flying and flashing my hot pink knickers I bought for the occasion. 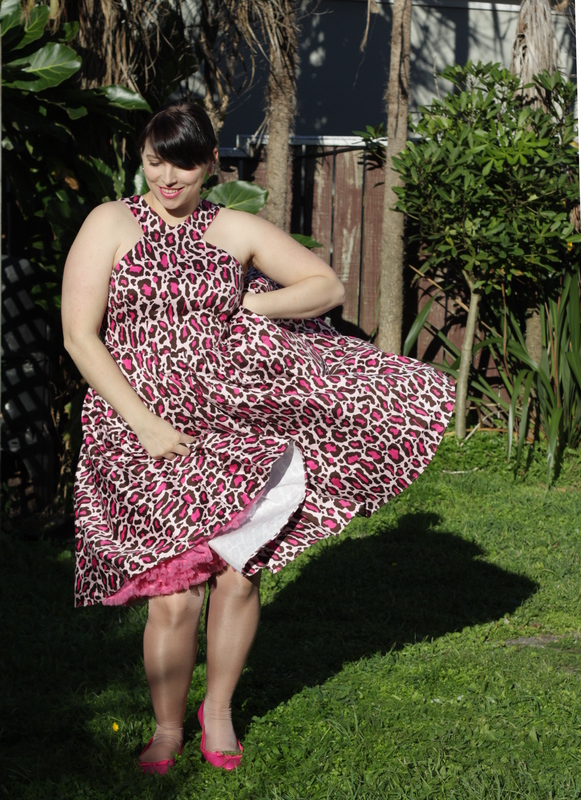 But I can’t leave you without a twirling pic at all can I! Guess what! There are two more items for this ensemble to show off. But given my complete inability to blog in 50 words or less, I’m saving them for the next post! I adore it! You lnew I would! There could be a blatant copy of it at the Brian Setzer concert in December- dont be surprised!!! Thank you! And, I hope there is a blatant copy of it at Brian Setzer, that’d be almost as good as going to the concert myself! I will be the Footloose Doll for you! Stunning! You look amazing in it. Awww, thank you, you’re lovely! And yes, I was amazed at the magic MrsC worked on the fit. You are just beautiful in ALL of these photos! I love this colour, dress and all round happiness and a job well done! 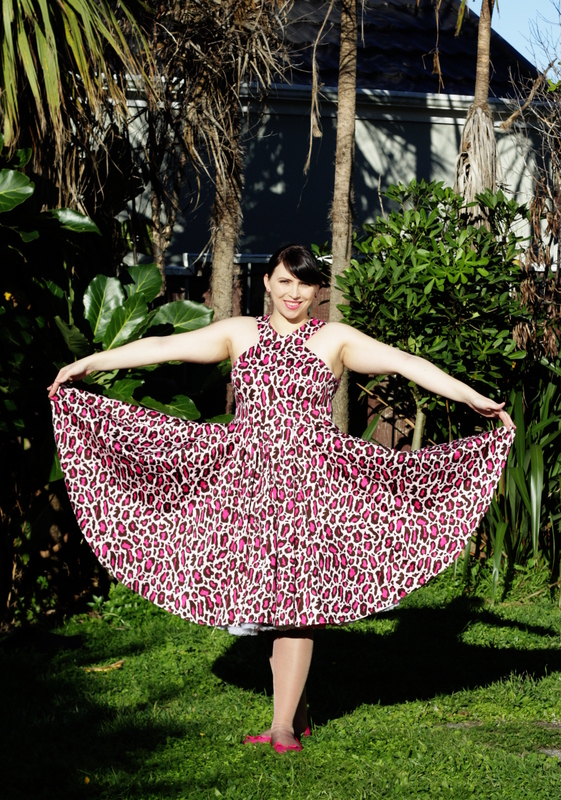 Super cool dress – looks totally fab on you. I love the matching nail polish, tie and pink mohawk. You totally rock! This dress is stunning on you! Love it! I think the bodice would be awesome justnas a top, its totally cool!! Imagine it with a pencil skirt! Oooh, I like the way you think! OMG ! I would like to have more words to say: your dress is pretty beautiful, but I just have that. And I can repeat: beautiful, perfect. Congratulations! You rocks!